Japan’s getting an iconic new taxi courtesy of Toyota. The new, aptly named ‘Japan Taxi’ (or Jpn Taxi for conveniently fitting on a rooftop sign) is already on roads, and bears a slight resemblance to London’s signature black cabs. The idea behind its design was indeed to make something that would be tied to its city’s identity as closely as the London black cab or the New York City yellow taxi, in fact – while also taking into consideration the reality of Japan’s rapidly aging society and other factors. The Japan Taxi is gearing up for widespread presence in Tokyo in time for 2020, when the city will host the Olympic Games. It’s intended to offer mobility for everyone, and also to help achieve a society in which seniors and those with disabilities can lead an active life, according to Toyota’s chief engineer for the project Hiroshi Kayukawa. Another goal with the design was to make the new taxi environmentally friendly, using a hybrid powertrain, and it’s also meant to convey a strong sense of hospitality for riders. They’re also designed to be remarkably durable vehicles, and to provide ample interior space and ease of getting in and out. The Japan Taxi features a low and flat floor, and wide opening power sliding doors which the driver can remotely open and close. That makes it easier to get on carrying a suitcase, and the interior space can be re-arranged quickly so that a wheelchair can be loaded into the vehicle more easily. The cockpit is designed to be more driver friendly, with a wide field of view thanks to an improved A-pillar, and the hybrid engine improves fuel efficiency and lowers emissions versus the vehicles it will replace. Japan Taxi’s distinctive exterior color is called ‘koiai’ in Japanese, or indigo blue. There is a long history in Japan of using indigo plant dye for various applications, most of which convey a ‘high-class and formal, yet also approachable’ feeling according to Kayukawa. The Olympic Games logo for the Tokyo games is also ‘koiai’ in color, so that fits with its plan to roll it out in higher volume in time for that event. Toyota says that currently about 70 to 80 percent of taxis on the road in Japan are Comfort or Crown sedans, exclusively intended for use as taxis. 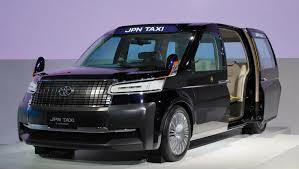 The Japan Taxi will replace the Comfort Style, which will cease production after more than 22 years on the road. Toyota anticipates that around 10,000 Japan Taxis will be on the roads in Tokyo alone in time for the 2020 games, and that’s gonna be cool.